Uncertainty abounds here. Scientists expected –173° Celsius but ‘the probe found temperatures closer to –203° — with no obvious explanation.’ Perhaps there is a place where enlightenment could be found, if they cared to look. Meanwhile the ‘gas only’ theory is under pressure [sic] again, as Pluto’s atmosphere apparently defies expectations. Pluto may be the only place in the solar system whose atmosphere is kept cool by solid hazes, not warmed by gas, says Science News. Blame Pluto’s haze for the dwarf planet’s unexpected chilliness. Clusters of hydrocarbons in the atmosphere radiate heat back into space, keeping the dwarf planet cool, a new study suggests. Pluto may be the only world in the solar system whose atmospheric temperature is controlled by solid particles, rather than gas, researchers report in the Nov. 16 Nature. Most planets’ temperatures are set by the gas content of their atmospheres, since certain gases trap heat from the sun more efficiently than others (SN Online: 6/8/15). Based on the nitrogen, methane and carbon monoxide in Pluto’s atmosphere, scientists predicted the dwarf planet’s upper atmosphere would be a brisk –173° Celsius. 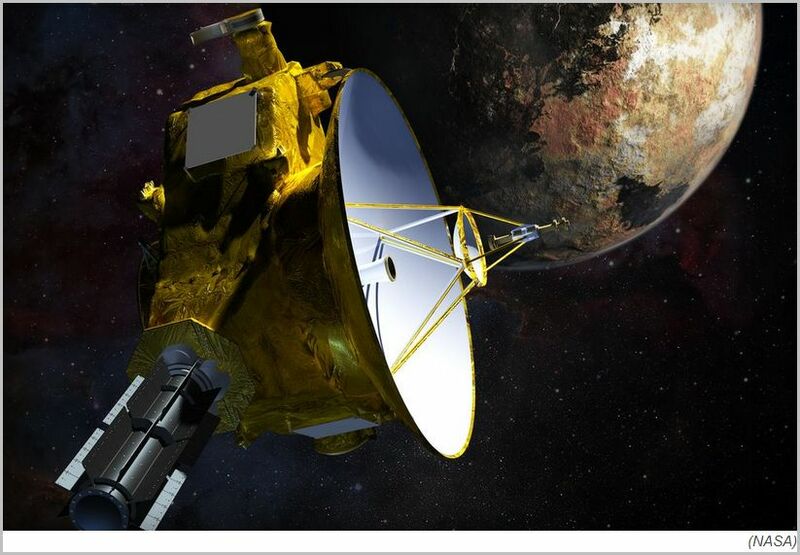 But when the New Horizons spacecraft flew past Pluto in 2015, the probe found temperatures closer to –203° — with no obvious explanation. The spacecraft found another surprising feature: Pluto’s atmosphere is separated into about 20 distinct haze layers. Solid hydrocarbon particles tens of nanometers wide clump together in the atmosphere to form the haze before eventually settling onto Pluto’s surface (SN: 4/15/17, p. 14). This haze could be what’s keeping the atmosphere cool, Xi Zhang of the University of California, Santa Cruz and his colleagues say. The team calculated that those hydrocarbon clumps could absorb heat from the sun as well as from gases in the atmosphere and radiate it back into space. Ultimately, the haze would cool the atmosphere instead of warming it. That makes Pluto unique in the solar system, the researchers say. Other hazy worlds, like Saturn’s moon Titan, still have temperatures that are mostly determined by gas. Lower pressure than expected, lower temperature than expected. Basing temperature expectations on gas composition didn’t work. Conclusion: favours N&Z atmospheric thermal theory over radiative gas theory, on first glance at least. Nikolov and Zeller (2017) predict Pluto temperature now (at 32.7 AU from Sun) to be 36.7 K.
-203 C would be about 70 K, rather higher than their estimate. However, clearly better than the 100K (-173 C) previously estimated by scientists considering gaseous atmospheres.mentioned at the top of the article. The N&Z estimate of pressure was 1.05 Pa. I imagine they used the new NASA 2015 value for pressure that Oldbrew mentions above? Simple really. Pluto is a long way from the sun. What ever sun light energy any radiative gas molecules absorb, half is radiated back to space. Double whammy for a cold planet. NASA says (link above): One explanation for the low pressure is that about half of Pluto’s atmosphere may have recently frozen onto the planet’s surface. If confirmed, it could indicate that further decreases in pressure may soon be in store. There’s also the fact that Pluto takes over 6 days to rotate once and the probe is going past it at 31,000 miles an hour, so a mean ‘Pluto temperature’ from such a short period of observation seems a bit of a stretch. I would be willing to wager that convective overturning within the atmosphere adjusts for the radiative characteristics of particulates within the atmosphere so as to ensure that the atmosphere remains in hydrostatic balance. 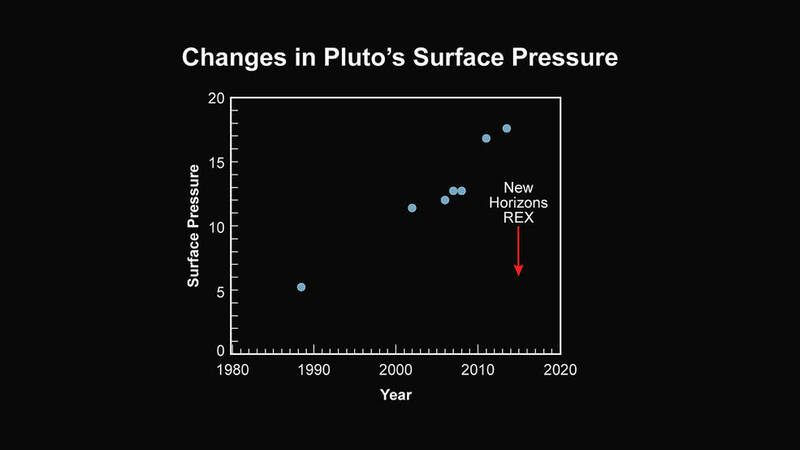 Thus we should still find (eventually) that at the same atmospheric pressure the temperature of Pluto will be much the same as that of the other planets once adjusted for distance from the sun. My old post here about adiabatic processes being particularly pertinent. The presence of methane, a powerful greenhouse gas, in Pluto’s atmosphere creates a temperature inversion, with the average temperature of its atmosphere tens of degrees warmer than its surface, though observations by New Horizons have revealed Pluto’s upper atmosphere to be far colder than expected (70 K, as opposed to about 100 K). However methane is only 0.25% of the atmosphere so this sounds a bit odd? Yes, Oldbrew. Many believe the lie about methane but it absorbs less radiation over the whole e-m spectrum than CO2 and it really plays no part as a greenhouse gas in any atmosphere similar to CO2 not being responsible for the surface temperature of Venus. It should be getting colder on Pluto as it moves further away from the Sun until about 2113, when it will be about two-thirds further out than it was in 1989 due to its highly elliptical orbit. Wikipedia: It was initially thought that, as Pluto moves away from the Sun, its atmosphere should gradually freeze onto the surface; studies of New Horizons data and ground-based occultations show that Pluto’s atmospheric density increases, and that it likely remains gaseous throughout Pluto’s orbit. I still have problems with atmospheres less than 0.1bar, affecting radiative exitance. More to learn here for sure, though. We have also determined the surface pressure and the local radius at both entry and exit. The best pressure reference is the mean value: 11.5 ± 0.7 microbar at 1189.9 ± 0.2 km. A unit of pressure equal to one millionth of a bar.